Why Plant a Tree? | Why Plant a Tree? 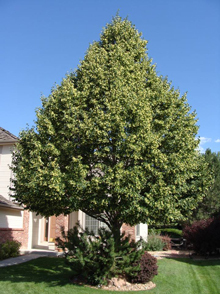 Colorado’s urban forest provides many environmental benefits to our community. Aside from the obvious aesthetic benefits, trees within our urban forest improve our air, protect our water, save energy, and improve economic sustainability. Unlike urban areas in the eastern U.S., canopy cover in Colorado decreases along an urban to rural gradient. In other words, since most trees have been planted much of the tree cover is in urban areas as opposed to “natural lands.” Therefore, estimated pollutant uptake rates are higher for residential compared to natural or unmanaged lands. Possible management implications of these estimates are that air pollutant uptake benefits from tree planting may be optimized by planting in areas where air pollutant concentrations are elevated and where relatively high planting densities can be achieved thereby enhancing the health of urban dwellers. Looking at trees helps us feel a sense of serenity. They seem to make life more pleasant. Trees have been shown to have an actual physical effect as well, enabling hospital patients to recover more quickly when their room offered a view of trees. Because of their potential for long life, trees are frequently planted as memorials, and friends and family members often become personally attached to the trees. It’s not unusual for a community to come together to save a large or historic tree, and residents are often resistant to removing trees when their cities plan to widen streets. Trees improve air quality, conserve water, and harbor wildlife. They moderate the effects of sun, wind, and rain. During summer months, the shade trees provide keeps us cool and provides protection from direct sunlight. The downward fall of rain, sleet, and hail is initially absorbed or deflected by trees, which provides some protection for people, pets, and buildings. Trees intercept water, store some of it, and reduce storm runoff and the possibility of flooding. A windbreak can influence wind speed and direction. Temperature in the vicinity of trees is cooler than that away from trees — the larger the tree, the greater the cooling. By using trees in cities, the heat-island effect caused by pavement and buildings can be moderated. The economic benefits of trees can be both direct and indirect. Direct economic benefits are usually associated with energy costs: air-conditioning costs are lower in a tree-shaded home; heating costs are reduced when a home has a windbreak. The savings in energy costs and the increase in property value directly benefit each home owner. Trees increase in value from the time they are planted until they mature, and well-landscaped homes are more valuable than those that have no trees. The indirect economic benefits of trees are even greater. Lowered electricity bills are paid by customers when power companies are able to use less water in their cooling towers, build fewer new facilities to meet peak demands, use reduced amounts of fossil fuel in their furnaces, and use fewer measures to control air pollution. Communities also can save money if fewer facilities must be built to control storm water in the region. To the individual, these savings are small, but to the community, reductions in these expenses are often in the thousands of dollars. List of benefits adapted from Trees Are Good (treesaregood.org).